My Sam's Club membership is due for renewal. I haven't seen the ad in the magazine since December. I also looked online and no longer see the discount as a benefit. Did we lose that benefit? Looks like that is so. Sure would have been nice if we were informed. Could have used the last ad before it expired 12/31/17. jm. Welcome to the Forum! First time I have heard of a Sam's Club discount. We get a discount from Amazon. What are the specifics on the discount for Amazon ? I didn't know anything about it . Unfortunately Sam's Club decided not to renew our agreement for 2018 and is no longer available as a member benefit. But we have continued discussions with Sam's and are making every effort to bring it back. What's with Amazon? Does it benefit the members or FMCA? It will be interesting to see how long the new Verizon deal lasts. It benefits both, my friend! When you use the portal FMCA gets a percentage of the purchase price and being that we're member-owned, what's good for the company is good for the members! A major $30 disappointment! Helped me justify membership in both organizations. I see Costco is still offering discounts. jb. Very sorry, you are very disappointed... You have been a member for 10 years...did you forget the real reason you became a FMCA member? Seems like many of the benfits are disappearing. I used the Sam'club discount all the time. Coach net has also disappeared. Michelin deal does not work in Canada. I've been a member for 40 years this past July. The reason I joined was that it was for motorhome owners. Now its open to all so the membership would grow, I don't think it will. At Gillette there was a whopping 20 trailers with a lot less motorhomes than in previous conventions. I'm on the verge of letting my membership expire in Oct. I feel your pain jb. I was a new member last year. We had recently made the change from fivers to class A's and I was looking to gain some knowledge on this forum and take advantage of some of the member benefits. Benefits seem to be going away and even the new ones introduced are generic and worthless (Verizon). As far as gaining some knowledge on this forum I enjoyed that benefit until a certain moderator didn't like what I had to say so that was no longer a valued benefit. I may still check this site from time to time but there would have to be some serious changes before I would renew. DD69. For my part, it was a pleasure to finally get to meet you in Gillette! I was surprised about the number of used coaches, new TT's and small # of new coaches. Yea, there's been a change! Joe S. I'm very happy to hear from you and that your keeping tabs on use...use pm, whenever you have a question or comment. Thanks Carl, good suggestion. 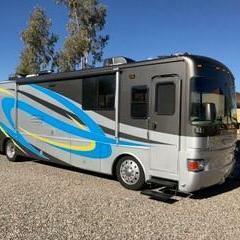 I suppose if the moderator who makes his living off the Rv community would resign I would rethink my future membership. However, that is very unlikely. Joe. Brett don't make a penny...all he gets is a headache! The other one was a stand-in while Brett & DW were in South America and a 32 day cruise! Brett is my friend on and off the Forum! My mistake Carl. Somehow I got the idea he had an RV inspection business or something like that. I'm glad he is your friend. I have never personally met him and probably never will. I did not agree or appreciate the fact that back in May he removed one of my posts and scolded me for it. The post was not in violation of any of the forum rules and was pretty mild compared to many I have read on here. It is my feeling that a moderator must be impartial and fair and not be influenced by friendships. Joe. I don't know who said what to whom or if your referring to Brett or Herman. Believe me, they are not influenced by friendship! I have had more posts and replies "deleted", than I can remember, also PM's and "Time out"! Brett has put himself, on time out, on several occasions. I say this because, over the years, I have enjoyed your input, knowledge and humor! Therefore I hope to meet you one day, just as I have met and forged friendships with several others on this Forum! I just had breakfast with Jim (Elkheartjim) Sims Friday. Joe L and family for a week in NM this summer! Don't want to write a book. Would like it, if you can put "Whatever", behind you and join us again! FMCA, most important part to me, is "Family"! Appreciate you thoughts on the matter Carl. It was Brett not Herman. We initially joined FMCA because it revolved around motorhomes. 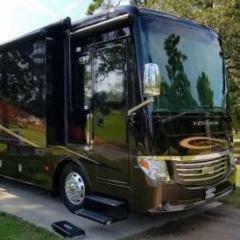 90% of our RV friends are in TT's and fivers but we had made the switch and wanted a resource that was geared totally toward that perspective. I enjoyed my time on the forum initially. Over the last year some of the benefits have started to head south and then a few months ago Brett's overbearing censorship really did it for me. I'm checking in once and awhile. If you or Jim S. were ever in the same CG as me I would certainly like to meet up and swap some stories and have a beer. However, in all likelihood I will let my membership lapse and move on. You have been with FMCA a very long time and I certainly understand why you feel it is like "family". From a new member's perspective I don't get that warm and fuzzy feeling though. I also have had my share of "Time Outs" and admonishments and not only on this forum. In 99.9% of the time I violated the rules, whether in a small fashion or on a larger scale. Here's an example of one on "A" forum. Someone was having problems with a piece of equipment. I said I also had one that didn't work if he wanted to buy it and have two. I was suspended for two weeks. I guess I should have prefaced it as a joke. I would wager that many times the moderator doesm't even se a post that may be questionable but I can see a scenario where several people don't particularly care for someone and get all their computer friends to push the abuse button. Can happen. Take it all with a grain of salt. We enjoy your company and ramblings. Thanks for the confirmation that Brett and I seem to being doing a good job. We both try to give as much free raine to everyone. But what we do not stand for is abusive & foul language, and personal attacks. There are times we will delete a topic only because it is duplicated and we delete the one or ones that haven't been responded to. Some time we may try to steer a topic back to the Original Post when they wander too for. Thanks to all who ask for help and for responding with help to a question. Let's get this back on topic! This thread is about "Sam's Club membership discount". Let's leave the thread here, but ONLY post on the original topic (Sam's Club Membership). OK. I can see where it would be a benefit for some, especially those with children! Linda has a regular and I've got a Commercial with a Fed tax #...another life! Bulk is not what you need for 2. Let's hope FMCA can reach a deal.